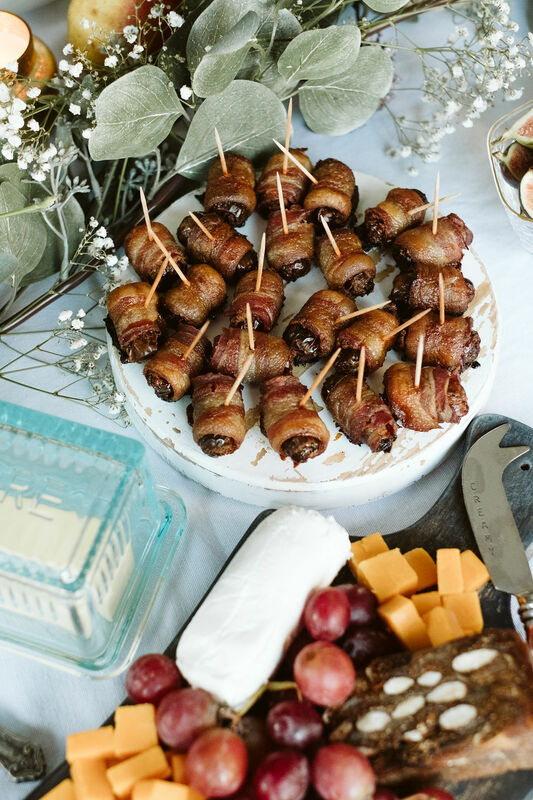 If I could pick only one appetizer to serve at a party, it would be these bacon wrapped goat cheese stuffed dates. I’m sure you’ve had a variation of them before, but if not, you’re in for a seriously delicious snack that’s both sweet and savory. And listen, if you’re new to hosting, then I must tell you that snacks and appetizers are a MUST during any kind of party or holiday. 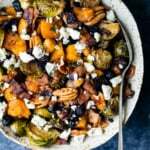 Your guests are bound to be a little hungry before you serve a meal, so it’s important you have a few things available for them to nosh on beforehand. It’s also important to recognize that sometimes things happen and meal-times get delayed. I can’t tell you how many times my cooking or prep times have changed and I’ve had to make sure my guests weren’t left starving and digging through my cupboards for a snack. 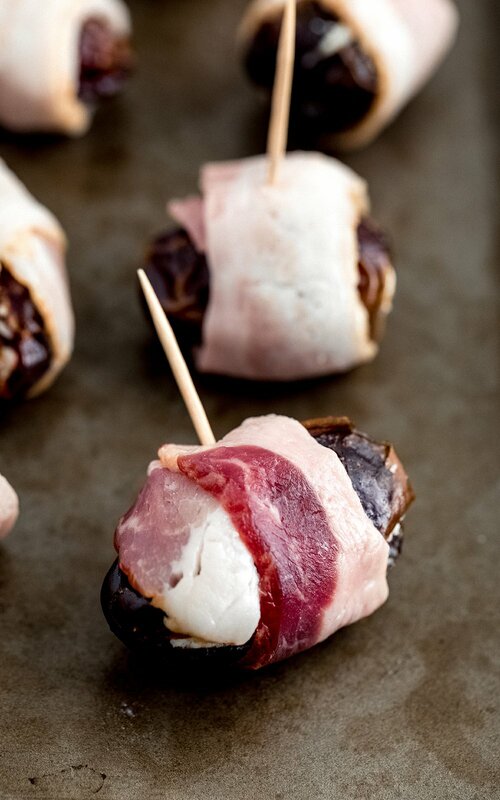 These bacon wrapped dates aren’t only adorable, but also SO DELICIOUS. 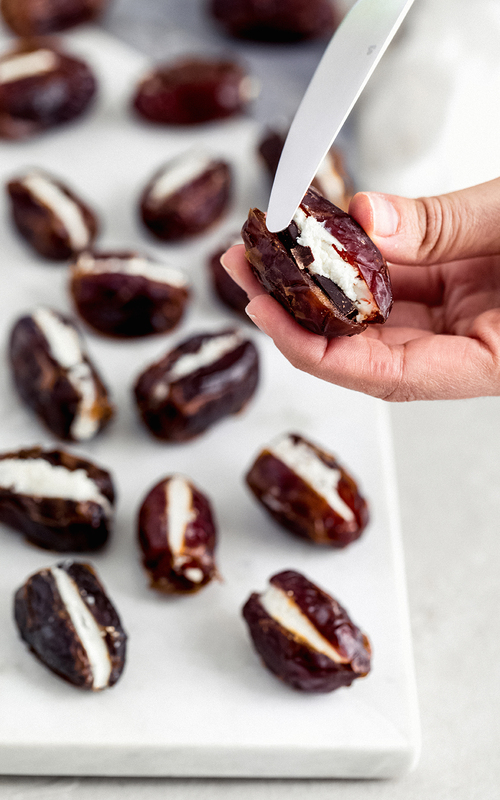 Each date is stuffed with dark chocolate + goat cheese then closed and wrapped in a half slice of bacon. I like to glaze my bacon with a little pure maple syrup and a sprinkle of cayenne pepper because hello, sweet and spicy is everything! 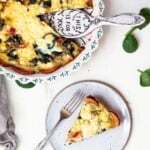 You’ll bake for 30 minutes, rotating the date so the bacon crisps up on all sides, then serve immediately or leave out for hungry guests to nosh on. 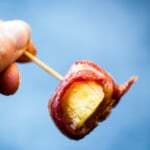 I love serving these bacon wrapped goat cheese stuffed dates during the holidays or for football parties. Either way, they’re bound to be a HUGE hit! Seriously, everyone always asks me for the recipe and I’m so happy I’ve finally added it to the blog. Enjoy! xo. P.S. If you’re not into dark chocolate, feel free to leave it out! They’ll still be delicious. Preheat oven to 375 degrees F. Line a baking sheet with parchment paper. You’ll want to make sure your baking sheet has some edges, as the bacon does produce lots of grease when cooked. 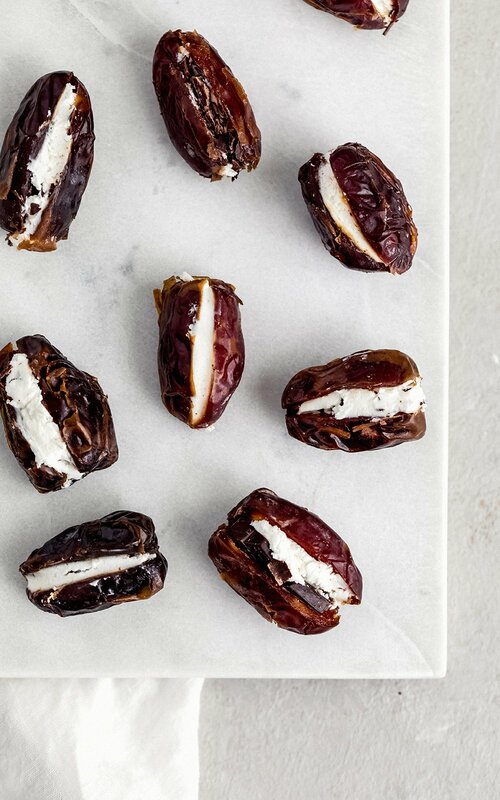 Split each date in half without breaking them fully apart. Make sure the pit is fully removed and discarded from the date if it already isn’t. Add a small piece of dark chocolate to your opened date. 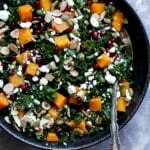 Spread a small amount of goat cheese mixture inside, and press together to close your date. Repeat with all of your dates. Next, cut your strips of bacon in half. Take one date and wrap ½ piece of bacon around it. 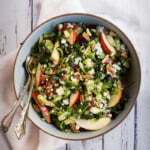 Repeat this step until each date is wrapped in ½ slice of bacon. Place all bacon-wrapped dates on large baking sheet with the bacon seam side down. 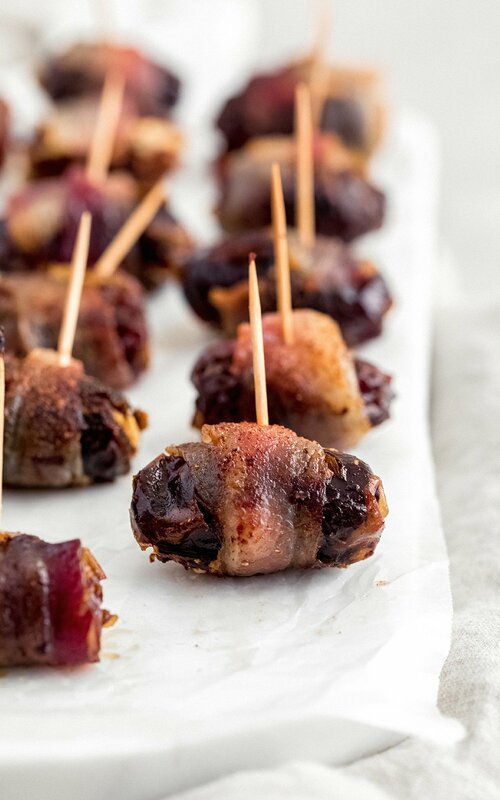 Brush each bacon wrapped date with a little maple syrup. 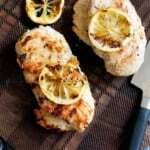 Sprinkle cayenne pepper on each date (use more if you like spicy flavors, and omit or only use a small pinch if you do not like spicy flavors). Stick a toothpick into each date. Bake in the oven for 10 minutes, then turn date on its side so that the toothpick is parallel to the baking sheet. Bake for 10 more minutes. Then flip dates to other side and bake again for 10 minutes or until bacon is slightly golden brown. Transfer to a plate to cool. Serve immediately. Serves 10, 2 bacon-wrapped dates each. The Best Creamy Garlic Slow Cooker Mashed Potatoes All the Recipes You Need for an Epic Thanksgiving + a Printable Menu! 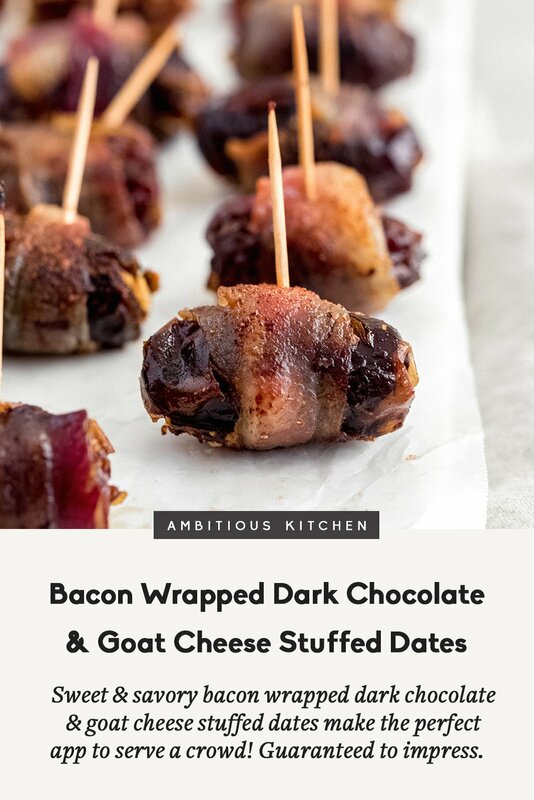 18 Responses to "Bacon Wrapped Dark Chocolate & Goat Cheese Stuffed Dates"
Interesting! i’ve made bacon wrapped prunes but not dates but I do like the sound of these. 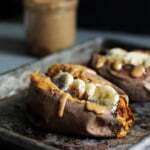 You’ll have to give these a try! They’re delicious. whoah. These are exceptional! So many wonderful flavors all together! Fabulous!!! They are! The flavors complement each other really well. 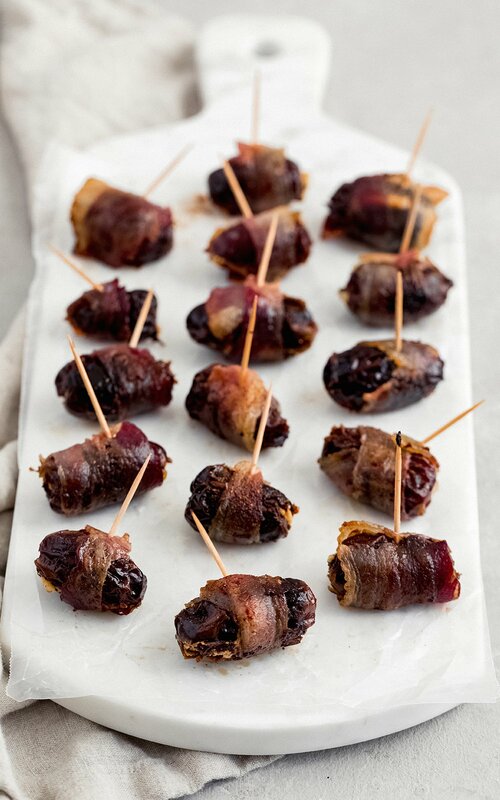 I love bacon wrapped dates and these sound so good! I think I’m going to have to add them to our menu for Friendsgiving tomorrow. Amazing! Hope you loved them! So excited to make these! I made your bacon wrapped plantains last year and they were a hit. Do you think it’s possible to assemble these the night before and bake the next day? Thank you! I served these as appetizers for Thanksgiving last week. Baked them on the grill (no room in my two ovens). They turned out amazing! So happy to hear that! These are probably my new favorite appetizer. Great idea to use the grill!